If you’re getting married in Thailand, there are plenty of ways to incorporate some of the kingdom’s traditions into your celebration. In addition to glorious white sand beaches, pristine jade-coloured oceans and gently swaying palms, Thailand offers plenty of fascinating cultural elements you may wish to infused into your destination wedding. For some, that might be incorporating some traditional Thai performances into the celebrations. For others, that might mean having a Buddhist wedding engagement ceremony. If you’re hosting your wedding in a luxury private villa, after all, the opportunities to personalise your big day are endless. We take a closer look at some of the traditional Thai elements that could lend traditional Thai charm into your wedding day. If you’re going to do things the Thai way, then you’ll want to arrange the schedule according to Thai beliefs – and every detail matters when it comes to planning the date and time of the wedding. In fact, Thai couples often consult a local monk to help pick out a lucky date for them to host their wedding. His decision will be based on the couple’s birth dates, lucky days of the year and phases of the moon. The time at which the ceremony starts also plays a big part. For example, Buddhist ceremonies will often start at 09:09 in the morning because nine is a lucky number in Thailand. One of the main perks of hosting a private villa wedding is that you can schedule the day as you like, down to the very last (auspicious) minute. 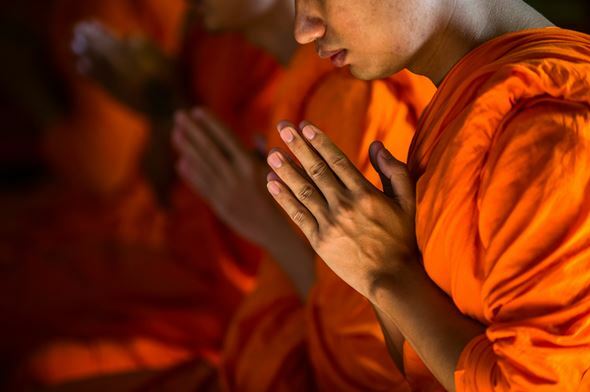 For Thai Buddhists, merit making is an important part of the faith. It is believed that giving to others is a way of bringing you good luck. One way that this giving spirit is enacted is by making merit – giving food and donations to local monks. This can be done by inviting monks to bless your wedding ceremony, where you will be able to make merit, or by visiting a local temple to donate money and items in the hopes of ensuring a lifetime of love and fidelity. For couples keen to incorporate some fun Thai spirit into the ceremony, arranging a Khan Maak procession is an excellent way to entertain guests. In Thai culture, traditionally the family of the groom discuss with the family of the bride how much dowry will be paid. Once this has been settled, the groom’s side of the family form a procession to take special gifts, laid out on trays, to the family of the bride. While the gifts were once items made of gold and precious metals, today it’s much more likely to be auspicious food items. The procession usually takes place around the corner from where the bride is staying – so the spacious grounds of your private villa will be perfect. 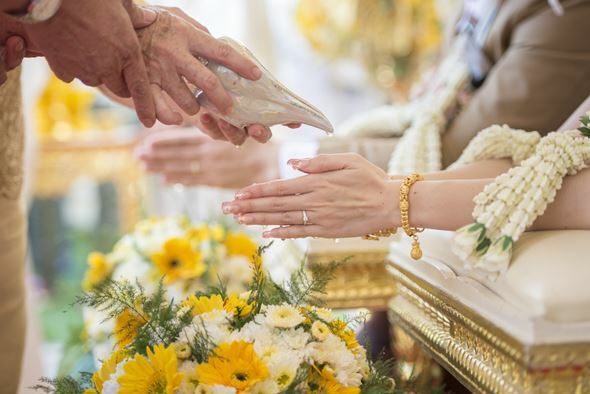 Thai Buddhist wedding ceremonies are loaded with symbolism, and the shell ceremony – known in Thai as ‘Rod Nam Sang’ – is one of the most important elements. A conch shell is filled with holy water, and each guest will have the chance to pour a little of the water over the hands of the bride and groom. This is the point at which the couple officially become husband and wife. The white thread ceremony is also very important. The newlywed couple sit next to each other as the person officiating the ceremony blesses the union. White threads soaked in holy water are tied to the wrists of the bride and groom to connect them. 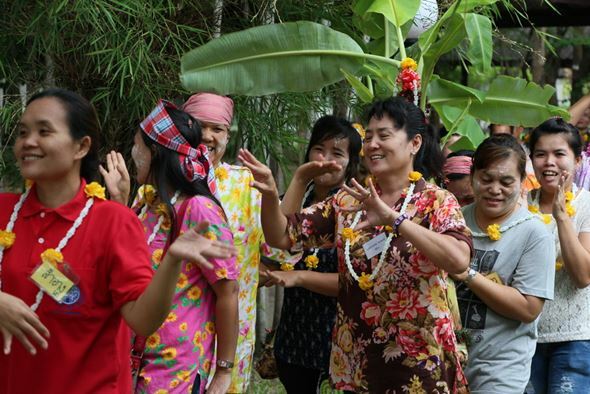 The ‘sai sin’ part of a Thai wedding ceremony also provides another chance for guests to get involved. Each guest comes to the front, where the bride and groom are seated, to tie a piece of white string around the wrists of the bride and groom (like a bracelet). It’s a sign of good luck, and the couple are supposed to wear their thread bracelets for at least three days after the ceremony has taken place.